Staff and students from the University of Greenwich (London) Landscape Architecture programmes are helping to make gardens for the school. The design of the Druk White Lotus/Padma Karpo School, by Arup Associates, is based on a Tibetan mandala. ‘Mandala’ is a Sanskrit word. It was used for the sections of the Rig Veda and became associated with a visual symbol, based on a circle and square, used for the layout of temples and the design of stupas and many other sacred objects. The school and campus were severely damaged by a mudslide in 2010. The site is in a cold desert and there is a great need for a garden and landscape environment. Our hope is to pioneer an approach to cold desert landscape design which will have a wider relevance in the Himalayan region. Global warming is causing the glaciers to retreat and putting the whole area at risk. A University of Greenwich landscape architecture student began work on Druk Padma Karpo in 2012. The Dragon Garden will transform the school’s environment from a barren desert into a lush and sustainable garden that will be used for learning, playing, sports and food production. What is special about the Dragon Garden? ‘Druk’ means ‘Dragon’ and is a Buddhist symbol. Ladakh is one of the last places where traditional Buddhist culture survives and its philosophy has influenced the design. Urbanisation is consuming previously cultivated land. The Dragon Garden is located in barren desert and will be an exemplar of what can be achieved to bring barren land into productive use with appropriate know-how. Our Landscape and Gardens Strategy is one of sustainability, including elements of conservation, habitat creation and biodiversity. Local people – both adults and children - will be able to experience what this means. By increasing the biomass through extensive planting, the garden will sequester a modest amount of carbon – and set a precedent for the Himalayan region. The school is already engaged in carbon offsetting through its solar energy scheme. How will the Dragon Garden help children? The residential students will live in a sustainable environment 24/7, the day pupils during school hours. During their time on campus their cultural heritage and identity will be reinforced by a 'learning through growing' scheme using a plant nursery, greenhouse and residential gardens. 'Learning through play' is a theme in the various gardens on site, using the adventure playground, infant playground and the sports facilities (Multi-Use Games Area, MUGA), cricket field, soccer pitches, athletics field, basketball court and archery range. Student participation in domestic production of fruit and vegetables will in due course introduce them to good horticultural and environmental practices - a modern version of their own heritage – and equip them with useful livelihood skills. The garden will influence students’ values by engendering respect for natural habitats, ecosystems and resources. The Dragon Garden will be an external classroom for teachers to bring lessons to life, where children can learn by ‘doing’, experiencing the joy of seeds growing and seeing various curriculum topics manifesting in nature. How can the Dragon Garden encourage awareness of and help prepare for climate change? Education is the answer. Some reputable scientists forecast that the lowest temperatures in 2070 on the Indian sub-continent will be higher than the highest temperatures today. If that turns out to be true, people will face enormous challenges with regard to food production, water availability and many aspects of life. They will need a keen awareness and expertise to find solutions. Students on the campus live with the consequences of a devastating mudslide triggered by unusual climate variations, and have an opportunity to learn relevant knowledge and skills in formal classes and from the external environment. What can the Dragon Garden teach about conservation? Being located in a desert area, the top resource to be conserved is water. The school's latrines, for example, are out of the water cycle and use dry composting. Water is used mindfully and we will use drip irrigation to increase the efficiency of water use from about 20% in traditional systems to around 80%. We aim to extend recycling so that all compostable waste is used to create soil, and other items are directed to suitable channels. Small-scale examples foster awareness and help train students, staff and visitors. What is the link between the Dragon Garden and biodiversity? The Garden is located in a desert area, with relatively little wildlife in the immediate vicinity. We will increase the biomass and extend the vegetated area, and hope the orchards and shelterbelt will provide a good habitat for birds. Through proximity to diverse plant and animal species (possibly through a small school farm in due course), the students will become aware of biodiversity and will take that awareness with them into adult life. Who is developing the Dragon Garden? A Ladakhi non-profit society, Druk Padma Karpo Educational Society (DPKES), is responsible for the school. DPKES has worked with Drukpa Trust, a UK charity, since 1997. They work with the Landscape Department of the School of Architecture, Design and Construction at the University of Greenwich, London. You can volunteer to come and help our team to dig, plant and create ... or you can help pay for our landscape team and the materials they need. We have developed a Landscape and Gardens Plan that embraces landscape architecture, garden design and sports facilities. It will enhance the award-winning building architecture by creating gardens and intimate spaces for activity, leisure and study, as well as larger sports areas. In view of the scale of the campus (around 11.5 hectares), we are developing the vision step-by-step over a number of years. Water. Water is the fundamental prerequisite for landscape development in Ladakh. The traditional approach involves irrigation channels that conduct melt water to small fields and orchards for flood irrigation. Though the system is well-understood and beautiful, it has several disadvantages: distributing water within fields is labour-intensive; water use efficiency is only about 20%. We are therefore installing a drip-irrigation network on the Druk Padma Karpo campus, which can supply the water necessary for landscape development in an efficient manner and exemplify a sustainable approach in Ladakh. Soils. The campus is built on the edge of an outwash fan. The area is strewn with granite boulders. It has minimal soil development, with low chemical weathering, and a relative absence of humus and sparse vegetation. To establish a vegetation cover it will be necessary to: encourage or create a vegetable soil with a good range of particle sizes, including sand, silt and clay; improve the availability of nutrients: nitrogen, phosphorous, potassium and trace elements; and build up the humus content of the soil. Kitchen waste, composted toilet waste and any organic material will be treated as treasure. Microclimate. 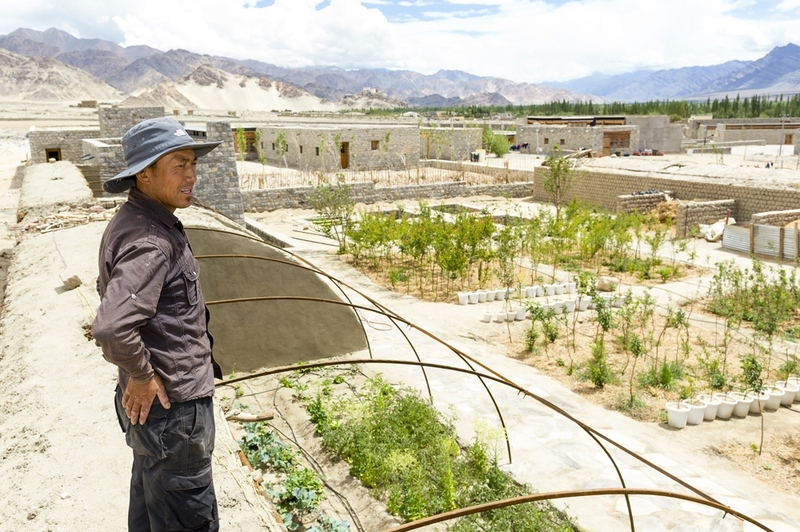 The growing season in Ladakh is short but productive, with relatively high summer temperatures, much sunshine and a relatively good water supply to the cultivated land. Strong winds and dust storms can however hinder plant growth. Walls, fences, shelterbelts, mulching and ground-covering plants can ameliorate the microclimate and create a virtuous circle for plant establishment. Vegetation and wildlife. With water, soil and shelter, there is every likelihood that a lush cover of vegetation can be established within the mudslide defence wall around the campus. The traditional Ladakh vegetation types can be created within the site boundary. Horticulturally, they will represent Ladakh’s landscape, comparable to the ideal landscape representations on a ‘mandala’ (a representation of the universe). Environmental sustainability. The people of Ladakh have sustained their local environment for thousands of years, but it is now being affected by climate change. Amid such change, it will be important to conserve what can be conserved while learning from the emerging technologies of a sustainable approach to environmental design - the outdoor equivalents of the award-winning trombe walls and solar-assisted toilets. Wildlife and biodiversity. Planting on the campus is being planned to enhance biodiversity, with special consideration for creating ornithological habitats because birds serve as marker and indicator species for habitat types, and because birds are a delightful component of a school environment. Environmental and vocational education. The school external environment will be a teaching and learning resource. This approach has been fostered by the Learning Through Landscapes Trust in the UK. The campus can be a teaching resource, a research resource, a preparation for careers in landscape management, eco-tourism and cultural tourism - and an exemplary project for the Himalayan region. opportunities for young people to get ‘hands-on’ experience of gardening, hopefully be inspired by it, develop a love for nature, and take their passion and livelihood skills on their life journey. Plant Nursery. Ladakh does not have a developed horticultural industry that can supply plants. The school therefore requires its own plant nursery and we initiated our own in 2012. This is an on-going developmental project that can potentially give some of the children commercially useful skills. Drip Irrigation. This is a pioneering opportunity to develop the use of modern drip-irrigation technology in a cold desert and to spread knowledge of its use to the homes and farms of the families who send their children to the school. We have invested in the core system and need continual expansion. Garden Team. The head gardener and gardener care for the features created with help from international volunteers. They also maintain the gardens, plants, landscape infrastructure and sports facilities throughout the year. They are key to the whole process. Adventure Playground. The adventure playground is under construction using natural materials that encourage students to run, climb and play – experiencing different textures and sounds. Residential Courtyard Gardens. In each of the four residential courtyards, window planters will be complemented by external seating areas and other features. Dragon shelterbelt. The School will benefit from protection by shelterbelts planted with Buckthorn (Hippophae rhamnoides) and the Ladakh Rose (Rosa macrophylla). Fruit orchard. With drip irrigation instead of flood irrigation, a range of fruit trees can be grown on the campus, including apricots and apples. We plan to plant and irrigate 9,000m2 in this way. Sports Facilities. For earthworks and to provide materials and equipment for sports facilities for the school’s own use and to enable it to host interschool meetings. The facilities will provide for cricket (of course), soccer, athletics, basketball, traditional archery and tennis. • Themed Gardens. Healing, music and science gardens are planned. Ladakh has a rich heritage of medicinal plants and long experience with its own Amchi tradition. A healing garden will showcase local medicinal plants. Music and science gardens will encourage the students to learn through play in these leisure spaces. • Multi-Use Games Area, MUGA. The ground is dry and sandy, which is not ideal for many sports. A hard-surfaced MUGA will create a clean surface for various courts to be marked out. The MUGA will ease the pressure on the basketball court, which is currently the only decent hard surface for games. • Serpentine paths. The routes between buildings are currently surfaced with sand and dust from the desert. The aim is to pave selected routes in slate. • Dragon entrance and gates. The green bodies of the Dragon shelterbelts, which will enclose and protect the school, will meet at the entrance in the south-east corner of the site. This will be a good location for Dragon Gates, inspired by the use of dragon symbols in Ladakhi art (e.g. the Dragon Throne at Hemis). • Lotus pond. 'Padma Karpo' translates as 'white lotus' and there is every reason to have a lotus pond on site. Nelumbo nucifera does not tolerate frost, but can flourish out of doors in summer. It will require protection in winter. Sacred to Buddhists and Hindus, the lotus is the national flower of India. Filled by seasonal meltwater, the pond will be a haven for wildlife and plant life in summers and a place for the children to ice-skate in winter. • Outdoor theatre/amphitheatre. Built using mud-brick and rammed earth, an amphitheatre will provide the school with the facilities for music, dance and drama, as well as being a platform for public events.